This year at our Tech Cocktail Celebrate Conference we had an awesome photo booth. It’s not just our team that’s fallen head over heels in love with the photo booth it’s kind of a big deal everywhere: weddings, mitzvahs, and corporate events. But we’re not talking about the old school photo booth where you go in, close the curtain, make silly faces (maybe even kiss), and get your strip of printed photos. The tech community finds these older models a bit clunky, cumbersome, and out of touch with today’s times. 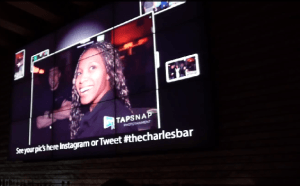 TapSnap has engineered a social media-savvy photo booth that’s not only sleek and portable, but also instantly uploads event photos to social media. The photo booth offers an interactive, 42-inch touch screen that showcases a range of customizable options and add-ons like digital props to corporate branding. TapSnap devices utilize Canon Rebel T3 cameras for professional quality digital pictures, while offering lab-quality prints for guests who wish to take physical pictures home. The direct social media connectivity means that TapSnap can also live broadcast events to guests’ networks. The company is based out of British Columbia, but they offer rental locations throughout North America, and even Dublin, to reach a wide range of users. Their latest and greatest feature, SnapCast, is a live, crowd-sourced photo feed of your event mixed with the Instagrams and tweets from the event.